Game meat was once seen as a luxury food, out of the reach of most people. The archetypal image of game from the British countryside is of the aristocracy feasting on grouse, pheasant, and partridge. Nowadays, we’re lucky to have game far more readily available, from places like Wild and Game, and in supermarkets. It’s undoubtedly delicious, and much lower in fat than more traditional alternatives. Wild and Game are a not-for-profit company providing food with game sourced from the British countryside. Their large range of products includes whole game birds, fillets, and plethora of pies, pasties and sausages. Further good news for game fans is that their range has recently expanded to include ready meals. Their Pheasant Tikka Masala ready meal is one of their new meals. It is delicately infused with herbs and spices, and has tremendously generous portion sizes. It’s delivered in a refrigerated box ensuring that it’s fresh and good to go when it arrives. The dish is creamy, huge and tastes incredible. The pheasant meat melted in the mouth. The whole dish was well made and complemented the meat perfectly. We recently had a large family gathering with a selection of different dishes. The Pheasant Tikka Masala was eagerly anticipated and enjoyed immensely. 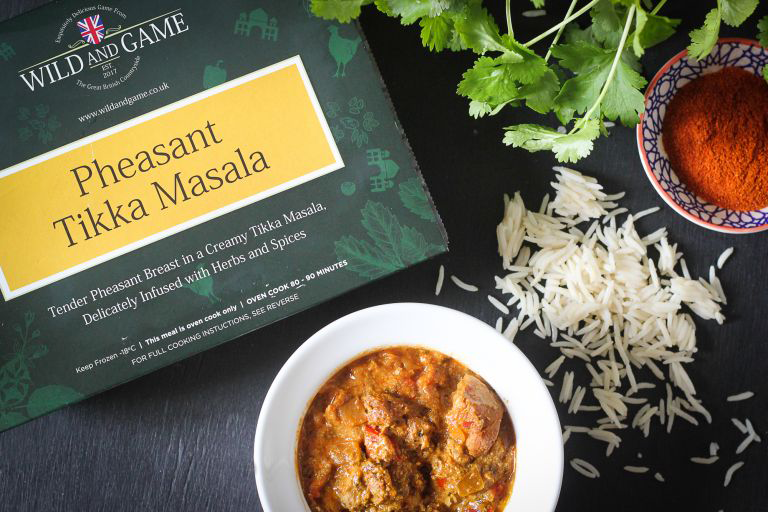 Wild & Game’s Pheasant Tikka Masala ready meals is £7.50 for a portion for two people, or £12.50 for a portion for four people. The full range of quality game foods can be found here. The full range of ready meals will include grouse with mushroom and peppercorn sauce; pheasant breasts with pancetta, mushroom and cider sauce; pheasant breasts Florentine; and the pheasant tikka masala reviewed above. Previous Article Carnival Games - Family Mini-Game Fun!